tholden wrote: The largest sauropods ... died out no more than a few thousand years ago. I thought they are supposed to have died out 60 million years ago. Am I mistaken? Lloyd wrote: The theory used to be that Earth was close enough to Saturn at least for a while that it developed a huge tidal bulge. But a Z-pinch squeeze seems more likely to produce that shape. I don't see any moons of planets that are egg-shaped, so tidal forces don't seem likely to be enough. * Fred said in the earlier post that the Z-pinch also made Earth spin much faster and that's what reduced the effect of gravity, so dinosaurs could reach huge sizes. That's interesting... Other posters on t.o convinced me that the tidal bulge idea wasn't going to work early on and Sansbury's theory of gravity does involve spin rates. Also interesting would be google searches on 'ica stones'. * If Z-pinches were strong enough during proto-Saturn flares, which Cardona says there were many of, Earth would have changed shape numerous times. It's hard to imagine how that would have produced the current shapes of continents and ocean basins. It's more complex than the other theories we've been dealing with. But it seems very promising. * The TB team and others were discussing the possibility in the Thoth email newsletter years ago that Earth had been egg-shaped in the past and that changing from that to spherical caused the continental movements etc. And now Fred has given a plausible means of getting the Earth to be egg-shaped. The theory used to be that Earth was close enough to Saturn at least for a while that it developed a huge tidal bulge. But a Z-pinch squeeze seems more likely to produce that shape. I don't see any moons of planets that are egg-shaped, so tidal forces don't seem likely to be enough. Very compelling arguements and logical alternatives to the expanding earth. In my mind, the expanding earth is a bit simpler to envision, and therefore makes a bit more sense to me. That said, I consider these hypotheses to be valid. As more evidence comes to light, we will hopefully continue to gain insight. Thanks for the info and links! Does that mean that humans used to have horns in the past as in the pictures? Or could it be that most of those "dinosaurs" are horses in dress, armour etc. 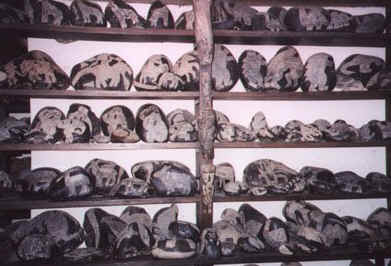 tholden wrote: Also interesting would be google searches on 'ica stones'. And most likely the hoax it was orignally admitted to being. The stegosaur in the glyph at Massinaw does have horns (along with the sawblade back and spiked tail) and it is true that real stegosaurs did not have horns. The horns were added at a much later date; Native Americans have always been in the habit of touching those glyphs up ever few decades or so which is why any of them survive at all. Again no modern animal has dorsal spikes as the glyph shows. There are no horned humans in any image which I have ever posted on any internet forum. The one person who "admitted(TM)" to forging an ica stone did so to avoid going to prison for selling a national art treasure. You should open your horizons a bit wider than just the talk.origins faq/fgu system; their claim of Ica stones all being forgeries is a transparent lie. The first collection of Ica stones which ever showed up around 1960 numbered in the tens of thousands, NOBODY is going to go to that much trouble and work on anything on pure speculation. In real life, somebody interested in profit from gullible gringos is going to make two or three of them and THEN, if they can sell those, worry about making up a next batch of ten or twenty, and work his way up to manufacturing thousands of them within five or ten years. * Tayga, most dating methods are not reliable. There are human footprints next to dinosaur footprints in Texas rock strata, as I recall. There are dinosaurs depicted in ancient drawings etc, I guess including the Ica stones. Some rock strata or formations that are said to be millions of years old have fresh features, as mentioned in numerous TPODs. Do a Google search for these four terms together, not in quotes: site:thunderbolts.info TPOD million years. Unfossilized dinosaur bones were found in Alaskan tundra along with fossilized ones. See the Mummified Dinosaurs thread. * Aardwolf mentioned on the Expanding Earth thread that there is evidence of expansion around the Arctic and Antarctic, which might contradict Fred's theory of Earth having changed shape. Naturally, we need to consider such evidence, as I'm sure Fred is probably doing. * The shapes of comets may tell us if Fred's on the right track, since they are probably undergoing Z-pinches, maybe moderate in strength, in their movements toward and away from the Sun. 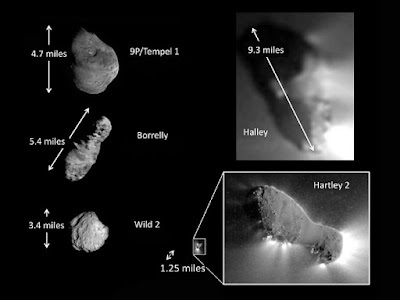 * This image shows the shapes of Comets Temple 1, Borrelly, Wild 2, Halley and Hartley 2 and their lengths and the next one shows Hale-Bopp. * Four of the six appear very elongated, similar to the soda can subjected to a lab Z-pinch in the earlier image previously here. I think that may be good evidence in favor of Fred's theory. I'll ask him if he's considered that. I suspect he has. tholden wrote: Again no modern animal has dorsal spikes as the glyph shows. tholden wrote: There are no horned humans in any image which I have ever posted on any internet forum. Then what are these (cut from the 4th image from your link)? I clearly was not talking about lizards or any other small animals and the creature you see on that canyon wall at Massinaw is clearly not a lizard or any sort of small animal. That image simply does not exist on Bearfabrique and I have no recollection of ever posting it anywhere. Could you give me some sort of a url or something to jog my memory?? Fred said: No, I hadn't looked closely at comets, but now that you mention it... Anyway, comets seem more to be in Wal Thornhill's expertise. ... My own focus has been on planetary bodies worthy of the name which could be distorted by the MHD polar column. * The images of comets above nonetheless show very possible evidence of having been squeezed by Z-pinches. - Fred said: ... Evidence of a north polar bulge would tend to support [my] hypothesis, which would merely mean that the Earth is still settling down after the last "shape-shifting" excursion. Without any definite confirmation, I won't go any further than that. - As mentioned earlier, the inversion from prolate to oblate form would have been a somewhat sedate damped oscillation, primarily because of the viscosity of the underlying magma, and which could have eradicated much of the polar extension. Now, understand that these are all mechanical effects, analogous to but separate and distinct from electromagnetic phenomena. * Cardona seems confident that the polar bulge is/was real. Here's what he & I said in the interview thread, where I was paraphrasing from his book, God Star. LLOYD: Page 466—The Arctic Ocean contains four depressions holding large volumes of sediment. If the sediment were deposited by tidal waves, other depressions, like Hudson's Bay and the Black, Caspian and Baltic Seas, should also have filled with sediment. The Eurasian Basin of the Arctic Ocean was caused by a tidal bulge of subcrustal magma and a collapse of the crust. CARDONA: It is the entire Arctic area that was uplifted in a tidal bulge. The Eurasian Basin itself is a *REG[IO]NAL* collapsed area that once occupied that bulge. LLOYD: Why didn't the magma pile up on the ocean floor and fill the Arctic Ocean? CARDONA: Because, as explained in the text on that same page, material was removed in that area from Earth's lower mantle. LLOYD: A swirling vortex of magma was detected 3,000 km under the North Pole. * Cardona calls the polar bulge tidal, but, although he may have proof that it was formed tidally, by having been perhaps too close to proto-Saturn, as far as we know, it could have been formed by Fred's proposed Z-pinch. * He said that magma below the bulge was removed, causing collapse of the crust above it. That's definitely evidence for Fred's theory and against Earth expansion. The latter would predict addition of magma, not removal of it. But Fred's theory would predict removal, because the polar axis of the Earth shrank as the magma moved to the equatorial zone. tholden wrote: I clearly was not talking about lizards or any other small animals and the creature you see on that canyon wall at Massinaw is clearly not a lizard or any sort of small animal. But you didn't draw the image did you. And the artist didn't label it so you don't know if the drawing is of a lizard or not. Those spikes certianly look more like lizard spikes than stegasaurus spikes. You would need explain exactly why its clearly not a drawing of a small creature. Is there a scale? A description? There's also a snake drawn underneath. Dinosaur snake? I suspect you see a dinosaur because you want to see a dinosaur. tholden wrote: That image simply does not exist on Bearfabrique and I have no recollection of ever posting it anywhere. Could you give me some sort of a url or something to jog my memory?? 4th image down just as I stated immediately to the right of Dr Don Patton's hand. I guess they are dinosaur humans. Aardwolf wrote: ...4th image down just as I stated immediately to the right of Dr Don Patton's hand. I guess they are dinosaur humans. And there is no reason why the "dinosaurs" can't be horses with armour or ceremonial dress etc. There are many cultures which put garments on its animals. There's a possiblilty the artist just drew a made up creature. Why does it have to be an actual creature. Artist have been known on occasion to draw mythical beasts from folklore or just their imagination. They may also be doodlings of a madman. The fact is those images could be many things. We will probably never know for certain but it's clear that you want to see them as dinosaurs so to you that's what they are. It would however be the worst drawing of a stegosaurus I have ever seen. My 3 year old grandson could do better. While stumbling through the desert i've seen tracks from creatures similar to the images Ted thinks are dinos. The tracks are on the tops of lithified dunes. This would memorialize the very end of the catastrophes. This would be the events associated with Mars, maybe the end of Venus, as presented in Worlds in Collision. The above tracks are from a three toed, 12' tall predator. A pocket T Rex. North of Moab UT.